Royal Caribbean confirmed today that Adventure of the Seas will be the fifth ship to undergo their revitalization process this year with an investment of $61 million to update the ship, which is the line's largest investment in updating a ship to date. The revitalization process not only refurbishes the ships, but also adds popular features that have been introduced on the line's newest ships in the fleet. The complete story appeared in the June 10 edition of Cruise News Daily. 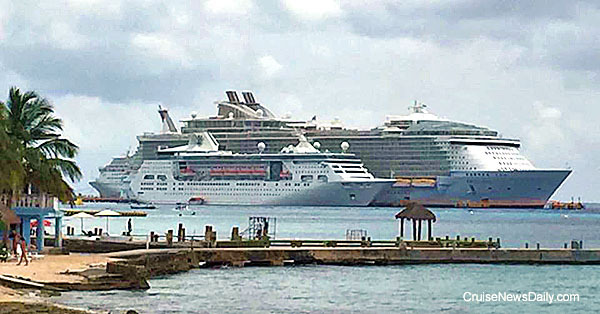 Royal Caribbean released this photo today of Oasis of the Seas (one of the largest ships in the fleet) docked next to Empress of the Seas (one of the smallest ships in the fleet). Empress just rejoined the Royal Caribbean brand after an extensive refit following its time with the Pullmantur brand. It is thought to be the ship Royal Caribbean will use for its Cuban program later this year. Princess passengers had better put on their tap shoes so they can sit in their seats in the Princess Theater and tap their toes along with the music in Princess' next big musical production from award-winning composer Stephen Schwartz - “Born to Dance.” The new show that pays tribute to Broadway choreography debuts on Princess ships this fall. Carnival Cruise Line has been in the Australian market for just four years yet they just passed an important milestone. The half-millionth passenger just boarded one of their Australian-based ships. 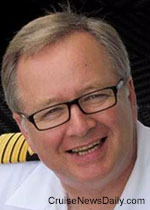 Seabourn has chosen Capt Mark Dexter as the master of Seabourn Encore which will launch in December. Veendam has aced its second consecutive US Public Health inspection. Yesterday we told you about Norwegian Jewel leaving the North American market for the winter 2017/2018 season when it goes to Australia. Having one ship less in North America and establishing another North American home port (San Juan) is going to cause some shuffling of ships and some shortening of the season. Although it got practically no coverage in the US, there was a sizable terrorist bombing in Istanbul Tuesday that killed 11 (including seven police officers from the rapid response team) and injured 36 people, three critically. What you should consider if your ship is stopping at a Turkish port. How Do You Pique James Bond's Interest? Do you know what Saturday is? It's World Gin Day. (Next year I'm getting a better calendar. It isn't on mine.) Ten thousand P&O passengers will be celebrating it across the fleet with P&O's Great British Gin Menu. Details appear in the June 8 edition of Cruise News Daily. With Norwegian Star going to Australia for the 2016/2017 season, is it any surprise that today, Norwegian Cruise Line announced Norwegian Jewel will be going there for the 2017/2018 season? Fincantieri cut the first steel today for Seabourn Ovation, the sister to the soon-to-be-delivered Seabourn Encore, at their Sestri Ponente yard near Genoa. Seabourn Encore is the first of a new class of ship and is currently under construction at Fincantieri’s Marghera yard. Seabourn Encore is set to be delivered by the end of the year. Seabourn Ovation will enter service in the spring of 2018. Cunard’s iconic Queen Mary 2 is taking something of a vacation. For 25 days (May 27 to June 21) it’s being “remastered” at the Blohm + Voss yard in Hamburg. When it returns it will be completely refurbished with some outstanding new features (including a fire hydrant and a lamp post to be installed in the dog-walking area of the kennel to make the canine passengers feel more comfortable and at home). The major new features include the new Veranda Restaurant which will replace the Todd English Restaurant, 30 additional Britannia Club Balcony staterooms will be created, and 15 new single staterooms will be created as well, and to make sure that fire hydrant gets plenty of use, ten additional kennels will be added. Below, we have some behind-the-scenes and time-lapse video of the ship arriving at the yard and being prepared for the work to begin. Celebrity Infinity collided with the pier in Ketchikan as it was docking on Friday afternoon, causing minor damage to the ship but rendering the berth unusable. It appears that wind was a factor, with the “sail effect” moving the ship with such force and speed the bridge was unable to stop it. A witness reported hearing the bow thrusters trying to control the ship and keep it from hitting the pier. The Coast Guard reported wind gusts up to 45 miles per hour at the time of the accident. Celebrity Cruises released the new names of the yachts they acquired in the Galapagos to expand their operation in the islands. But something is missing. The 48-passenger Eclipse will be renamed Celebrity Xperience. The smaller 16-passenger Athala II will become Celebrity Xploration. Silversea has scheduled a 2018 world cruise with Silver Whisper sailing from Los Angeles to Civitavecchia (Rome). The 121-day voyage sets sail on January 6, 2018. The cruise takes the long way to Europe via the Pacific.